This morning's short stroll felt more like a walk through the vineyards. Hills were planted with grapes; and small baby grapes were visible from the road (shown). Elsewhere berry bushes were in bloom (pictured at right), and a half dozen sheep munched on hay in the shade. It was a nice day, which promised to get much warmer; so I was glad to get out early. 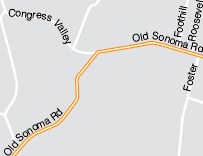 My SW turn-around point was Vine Village (non-profit) on Old Sonoma Road. And I walked (NE) a little over the crest of a hill, before turning back. With the warm weather predicted this weekend, I was enjoying what was likely the last of the little patches of green grasses on the side of the road. Soon the hills (except for the irrigated areas) will be golden brown. 1 red-winged blackbird; 6 sheep; 1 yellow and black butterfly; 1 great blue heron and 1 great (white) egret) flying around in the tall trees on Vine Village property; 5 black birds (orioles? ); 3 little brown jobs (LBJs); 2 relatively small brown lizards; 2 unidentified flying bugs; 1 (recently dead) skunk. Start and Stop: Beginning of Trail downtown and headed south; one last segment in Kincaid Park area, Anchorage, Alaska. Just seeing if you were paying attention...This is not the San Francisco Bay Trail, it's the (11-mile long) Coastal Trail in Anchorage, Alaska. I was able to cover a little more than half of the coastal trail in the evenings when I was in Anchorage. It did not get dark until about 10:30 p.m. This was very nice. I could do other sightseeing during the days I was in Anchorage, and walk the trail from 6-10 p.m. If I'd had another day or two, I might have finished the whole thing. 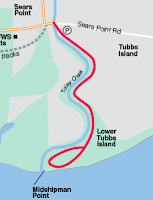 The trail is a paved (asphalt) bike and walking trail that starts in downtown Anchorage by the water/port, and continues along the shoreline (south) past a few different parks (e.g. Earthquake Park), the Ted Stevens Airport, and it eventually ends in Kincaid Park area, south of the airport. The trail was fairly popular. I saw several people bicycling, walking themselves and/or their dogs. To potential walkers in the Bay Area: it sometimes gets chilly up here in Alaska; what's your excuse? My favorite wildlife encounter was with 3 moose in Kincaid Park, the last evening I went walking. One of the three is pictured at right. After walking the full length of Casa Grande Rd., I arrived at an old Adobe house, part of Petaluma Adobe State Historic Park. Unfortunately, after walking down Adobe to the park's entrance, I discovered the park was closed due to budget cuts. I walked back down Casa Grande, and paused briefly to visit with a sheep who trotted up to the fence to say hello. It was probably hoping for a snack, but it had to settle for a scratch behind the ears instead. What a friendly sheep. When I returned to the SW end of Casa Grande, I walked a small loop trail around the Rocky Memorial Dog Park (not shown on map); well worn dog ball (shown) at marsh grass edge. 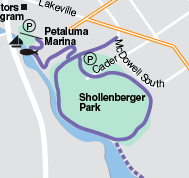 And then I tried to find the entrance to Shollenberger Park trails (shown as purple lines on map). 13 crows; 19 little brown jobs (LBJs); 6 sheep; 10 swallows; 11 red-winged blackbirds; 2 dragonflies; 1 turkey vulture; 1 blue and white kite stuck in telephone wire; 2 mattresses; 9 cows (grazing in distance); 2 lizards (+ 8 blurs in bushes); 1 killdeer; 1 bumblebee; 4 planes flying in formation; 1 fly; and 3 unidentified flying bugs. Imagining that I might be almost 1/2 way around the Bay, I celebrated by taking the longest walk since I started, the Tubbs island trail in Sonoma. Along the way, I enjoyed listening to red-winged blackbirds (shown), and views of agricultural fields, wildflowers and green fennel that lined the edge of the trail. And I had a nice view of the bay along the water. In the distance, looking east, I could peer into the Carquinez Strait. Because of the trail's length, I have a feeling not many walkers get all the way out to the end. To those who do go this year: warning, this trail eats shoes and spokes. I might have avoided the whole shoes getting sucked into the mud fun if I'd been a trained circus monkey and could have scampered over the metal, wide ladder-like structures bridging two gaps in the trail. But, alas, I was a clumsy human. I was puzzled to find the first of these structures. As I wanted to complete the trail, I had no choice but to walk around it. I thought I had safely made the crossing when, sluuurrrp, sluurrrp, I managed to step on a small area of quicksand-like mud, which sucked off both my shoes. Fortunately, I was able to reach into the mud and yank them out. Otherwise it would have been a very long 3-5 mile-walk back to the car. The good news was that the mud managed to seal off a few areas where little stickers had been getting in and poking my feet. Earlier I met two bicyclists, and one had lost some spokes (pictured) to a woody clump of plants growing in the middle of the trail. 1 lizard; 37 red-winged blackbirds; 15 little brown jobs (LBJs) (includes 6 yellow finches); 3 clouds of (waist-to-eyeball-level) gnats; 2 areas w/ ants; 12 unidentified brownish shorebirds; 26 ducks; 6 white butterflies; 1 snowy egret; 1 great egret; 1 ladybird; 1 kite; 1 sea gull; 1 rabbit; 2 hawks; 1 bumblebee; 1 cormorant; 2 pheasants; 1 turkey vulture; 1 killdeer; 1 small black beetle; 3 unidentified flying bugs. Today was a nice spring day, and this trail was a great place to watch birds defending their young. Red-winged blackbirds and other birds were dive-bombing crows, kites, and other birds of prey in the air, probably trying to keep them away from nests. There were lots of rabbits: sitting in the shadows together, sitting in the sun, and bounding across the trail. The sun also brought out a few lizards (one shown at right). And, there was some kind of large swan boat? 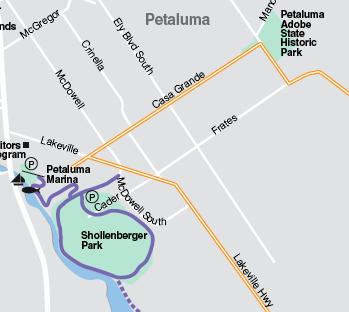 on the south side of the Petaluma River. Within minutes of starting to walk, two killdeer appeared and were dashing around frantically and making loud cries. I realized they may have been protecting newborn chicks. Sure enough, I stopped on the trail and looked more carefully, and saw two little killdeer fuzzballs (maybe 4 inches tall) running around reacting to their parents panic (pictured - although they're not 100% clear after zooming in so much). 10 killdeer (including two chicks); 33 swallows; 22 little brown jobs (LBJs); 9 rabbits; 1 falcon or smaller hawk; 11 ducks; 2 lizards; 7 red-winged blackbirds; 4 blackbirds; 1 dove; 36 unidentified brownish shorebirds; 2 sea gulls; 1 spot of bird poop on my shirt (another first); 2 Clarks Grebes; 1 turkey vulture; 1 willet; 5 black-necked stilts; 2 little yellow finches; 3 unidentified flying bugs (UFBs); and 1 crow.